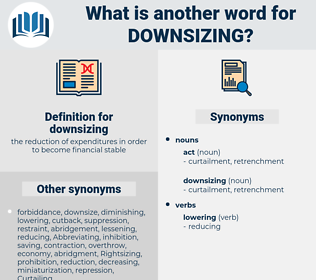 What is another word for downsizing? shrinking, reducing, lowering, cutting, decline, cutback, attrition, mitigation, shortening, diminishing, reduce, lessening, alleviation, disengagement, abatement, reduced, redundancy, Phasing, markdown, downgrading, scaling, cut, decay, minimization, simplification, austerity, minimizing, decreasing, Diminishment, withdrawal. minimising, squeezing, streamlined, lightening, ameliorating, Abolishing, lower, constraining, declining, restricting, Addressing, eroding, Simplifying, offsetting, slimming, confining, diverting, reduction, Mitigating, Involving, Relieving, Reversing, Impairing, dropping, Suppressing, slashing, Alleviating, scrapping, abating, Levelling, Depleting, Stemming, curbing, limiting, moderating, creeping, Overcoming, falling, derating, driving, focusing, controlling, streamlining, narrowing, shrinking, reducing, lowering, cutting, shortening, diminishing, lessening, reduced, Phasing, scaling, cut, minimizing, decreasing. 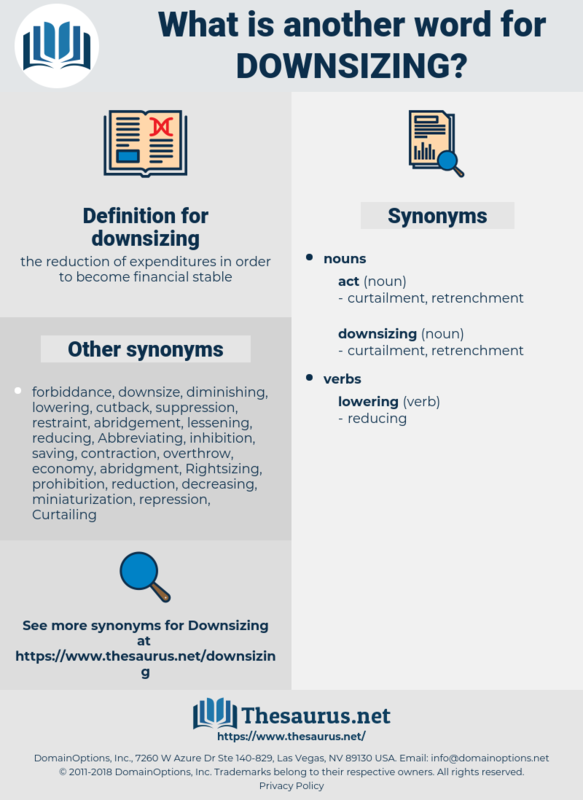 downscaling, streamlining, rationalization, rationalisation, narrowing, restructuring, decrease, contraction, compression, diminution, draw-down, shrinkage, layoff, size, drop, shrink. dankness, dancing, dance music, damaging, Detumescence, dimensioning, diminishing, denseness, downswing, dinginess.